The BBC's Director of Strategy James Purnell has told the Commons Culture, Media and Sport Select Committee that linear TV channels will be around for a long time, despite the rise of on-demand viewing. And within weeks of a final announcement about BBC Three moving from linear TV to online, he admitted there was a "big part of the youth audience that had limited access to online content at all". He explained that was one of the reasons why the BBC had originally proposed to launch BBC One+1 once BBC Three is removed from linear TV platforms and to mitigate the loss of younger viewers. Following weeks of speculation over which BBC service might be cut next, he admitted that BBC management doesn't think channels are going to get replaced by on-demand, adding "They're going to be around for a long time". 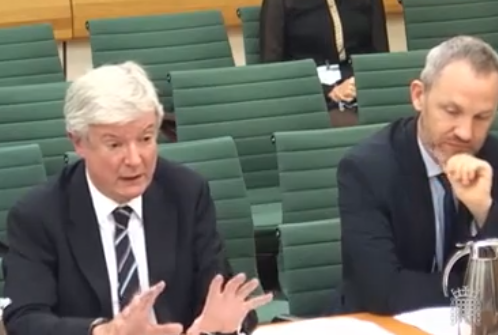 During the same session, BBC Director General Tony Hall even seemed to 'touch wood' when talking about the broadcaster's plans for BBC Three. "When you free up the creative people from having to fill a linear channel from 7 until the wee small hours of the morning and concentrate on what content we can really offer, partly long-form but also new forms as well, I think it's a really exciting challenge and I find what the team are doing really exciting and invigorating and I'm sure [taps desk twice] will be successful." He also confirmed the broadcaster had no proposals to close children's channels CBBC and CBeebies. Recent attempts to encourage BBC Three viewers to similar shows on BBC Two has been met with mixed reaction and low audience figures. Research, originally published last year has previously shown that BBC Three attracts a higher proportion of low income households than other channels, who may not have unlimited internet access. A significant proportion of BBC Three's audience don't access any other BBC TV service, something the BBC may need to address in addition to running a promotional campaign for BBC Three Online. BBC Three was originally due to close around about now, but received a stay of execution until at least the middle of January, when it is due to be replaced by a promotional service until the end of February. The final timelines for BBC Three TV are due to be announced in the coming weeks following the end of a second BBC Trust consultation on the matter, which closes on the 30th September 2015. Just increase the licence fee properly to pay for all BBC serivices, then we can get rid of all this pointless talk. ...Or stop airing so many auction shows on BBC One and Two and actually /do something/ with that time. No wonder the country is obese with all the cookery shows on tv.